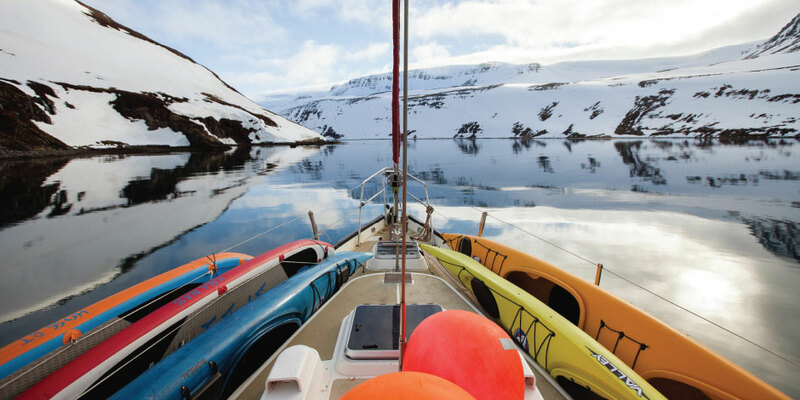 An experienced traveler connects the past, present and future on a sail and ski adventure. In the late seventies, Sandra Dykstra skied into Skoki Lodge, an historical backcountry destination in the Canadian Rockies. An east-coaster for the majority of her life, she was not an avid mountain woman. My father was passionate for the outdoors and continuously encouraged her to step out of her comfort zone to embark on adventure. And so she did, on a ski trip while three months pregnant with me. I like to think that this is where my own love of adventure, and a passion for snow and skiing, was born. Two months later we were en route to Reykjavik. We rented a car big enough to fit us, our skis and my sleeping bag, a convenience since I hadn’t slept in 24 hours. We drove north for six hours, stopping to nap and visit with the abundance of Icelandic horses, basking in sun and surrounded by ice. We arrived at our destination of Isafjordur, a small fishing village in the West Fjords where we found our floating backcountry hut, the Aurora Arktika, moored in a little marina close to the centre of town. We tried to get some sleep, as we would set sail the following morning with 12 other people. The day had arrived. With a mixture of nervousness and excitement we loaded our gear, met Captain Siggi and our fellow travelers, and hit the high seas. Within hours we’d arrived in Hornstrandir Nature Reserve and were gearing up for a quick lap before dinner. The next morning we woke to blue bird skies, which set the precedent for the rest of our trip. We skinned up fjords and skied their backs on spring corn to meet with the ocean. Our captain and his trusty zodiac awaited to return us to the Aurora, anchored safely in the bay. 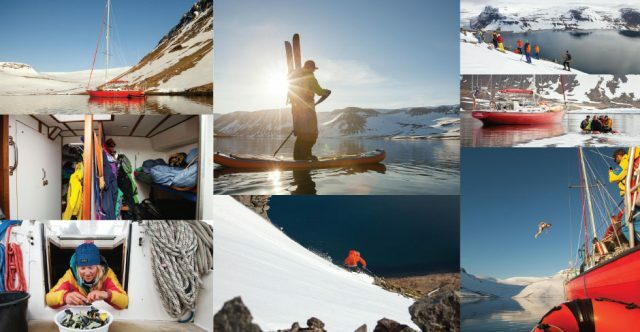 Six days spent skiing five fjords was an unforgettable experience. When we weren’t exploring on skis we went paddle boarding and witnessed arctic foxes cruising the shoreline. We even braved the cold seas for an invigorating swim. We picked mussels from the beach for après and ate meals prepared to perfection with ingredients plucked from the surrounding land and sea: ceviche, kjotsupa (Icelandic meat and vegetable soup), cod, haddock, and salmon. The ideal timing of our trip allowed us to witness the Aurora Borealis. It’s difficult to describe how it felt to stand on a boat in near darkness, miles from the Arctic Circle, watching the lights dance across the northern sky. It was a magical experience embedded in one of the most amazing trips of my life. Once our week came to an end, we said our thank yous and goodbyes, boarded a plane back to Reykjavik, and headed home. A few weeks later I found out I was pregnant with my first child, and knowing she was part of this epic journey put a smile on my face. My hope is that it has planted the seed for Jolene’s own love of snow and skiing, setting the stage for adventures to come.